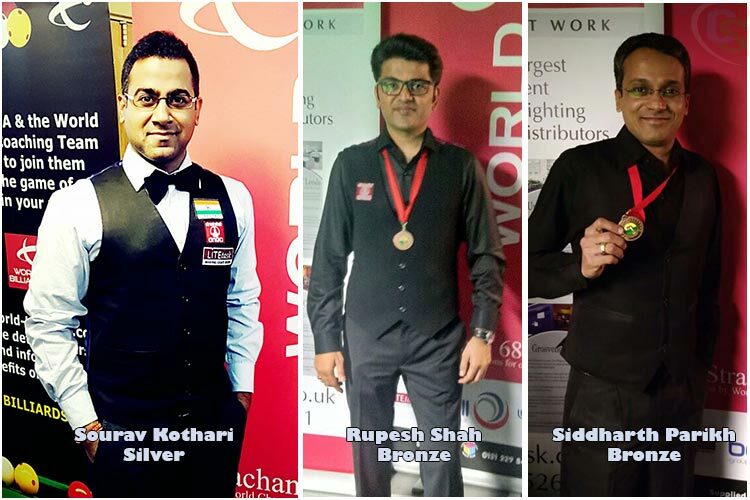 Reigning national champion Sourav Kothari earns Silver medal from the just concluded short format WBL Billiards championship 2017 held in Leeds, England. Last night in the final Kothari lost to Englishman David Causier 4-8. Sourav did not have a good start and was down 4 games in a short span on time, but after that having aid of 69 unfinished break, he managed to get a breakthrough and reduced the deficit. 10th game had an extremely bad taste, which Kothari lost by just one point and that remained a game changer for Causier, with Silver to Kothari. Two other Indian players, former World No.3 Siddharth Parikh and three times World Champion, Rupesh Shah claims bronze from the championship. In semi-finals, Rupesh lost to Causier 4-7, whereas Siddharth Parikh went down to Kothari 5-7. The Long Up format of WBL Billiards championship will start from today with the final on 1st December.